There is a newfound need to build upon the recent security upgrades at DBHS. In light of the recent, and unfortunately frequent, shootings, most recently at Marjory Stoneman Douglas High School, campus safety has been and continues to be a concern for schools across the nation. Though recently, Diamond Bar High School has spread the word about “run, hide, fight,” there are still changes that the school should make to prevent and mitigate the damage caused by a potential active shooter on campus. Security at DBHS seems to be more concerned with keeping students in the school rather than keeping others out. While it is important to stop students from cutting class, keeping outsiders from entering also needs to be a priority. Security guards will immediately question a student walking out the gate without fail, yet virtually anyone can slip in without being checked for an ID. 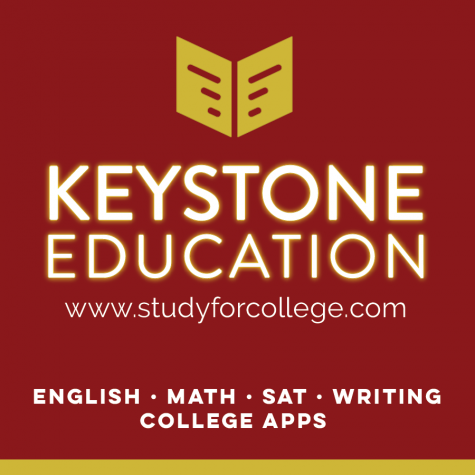 Adults can leisurely walk in under the assumption that they are picking a student up early, and anyone that looks young can pass as a late student. Security guards watch the front gate, but there is a severe lack of supervision in the lower football field. We are not asking for TSA security checkpoints, but simply that guards ensure that everyone entering the school is questioned just as much as those exiting. Security guards should be present as long as there are students on campus, even after school hours. Many activities are held after school and on weekends with little or no security. The gates are wide open with potentially hundreds of students still on campus. Many may feel more secure with armed security on campus; however the number of accidents and injuries may ultimately outweigh the benefit. There is also a lack of security cameras on campus. If suspicious activity did occur at DBHS, there would be no recorded evidence of it. What goes on inside classrooms is equally as important as in the halls to ensure the safety of the school. In the past, DBHS has had, at most, two lockdown drills a year, and even with recent events, they are still not taken as seriously as they need to be. Too many teachers simply lock the doors without saying a word to students and continue teaching. If DBHS wants the students to take these drills seriously, students need to not only be informed about proper procedures, but practice the execution of them, lights off and all. Yes, precious class time is briefly interrupted, but it can drastically change the outcome in the case of a serious emergency. A large number of teachers have decided to keep their doors locked at all times, which can cause a small inconvenience but is a fair trade-off for safety. However, something to be considered is that if the school were ever to go on lock down, what would happen to the students going to the bathroom or TAs running call slips outside of classes? We like to assume—and hope—that DBHS will never go through such a scenario where the staff and students are in danger. 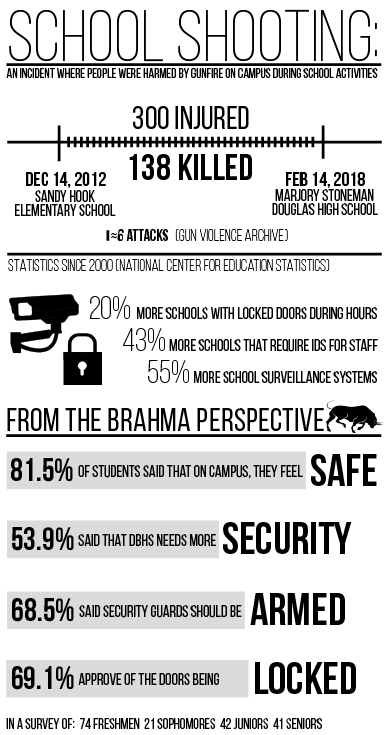 However, while there is no guarantee that any campus is completely safe and exempt from these situations, there are improvements that could be made to further ensure safety at DBHS.